According to recent figures released by the Australian Rugby Union, Women’s rugby participation continues to soar worldwide as well as in Australia. The ‘Olympic’ effect of the Women’s Sevens Rio gold medal in 2016 was significant, contributing to a thirty three percent spike in female Rugby Sevens participation. Meanwhile, Women’s Club XVs rugby grew by a massive twenty four percent. After a strong start to the season the Melbourne Unicorns Women’s team are off to a flyer with a 2-0 record. The Women’s Rugby Development Association (WRDA) takes a look at the season ahead with Head Coach Alana Thomas. What are you expecting from the 2017 season? We are looking to improving with each game we play; the competition looks like it will be very even this year. We have several new players to the club and a change in coaches so we will look to develop our game as we move through the season. As mentioned we have had several new players come to the club and we have lost a few that have headed back overseas or moved on to other clubs. So that has added some new energy to the team and fresh ideas. We also see Hartley Tawhiri join the coaching team and Junior Faatoese returning to assist so we have a solid base to work from. You will have to come watch our games and make your own mind up as we feel you need to watch all our players as a champion team will always beat a team of champions. How do you see the future of women’s rugby in Victoria? Over the last couple of years we have seen the game grow and with the injection of the youth girls comp we now have players coming through a pathway to senior rugby. We need to continue to focus on both 7’s and 15’s as the 7’s is a great introduction to rugby and then players can progress to 15’s. Rugby is the game that caters for all shapes and sizes which makes it unique from other sports. The WRDA is affiliated with the Victorian Rugby Union and the Melbourne Rebels. 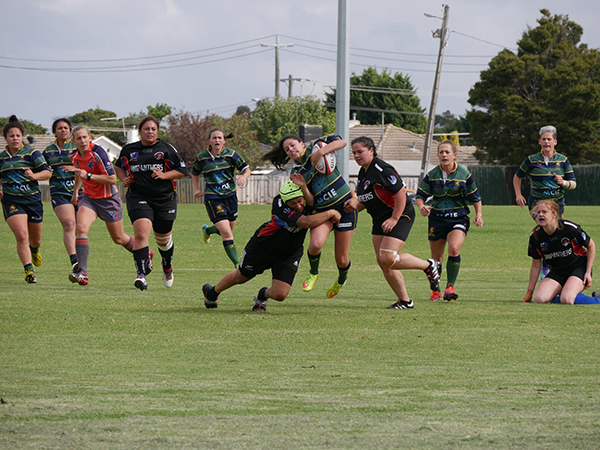 The association supports the development and growth of women’s rugby, both 15s and 7s, in Melbourne, Victoria. With both a 7’s and 15-a-side National tournament played each year and pathways to play the game internationally there has never been a better time to get involved.